All the fans of Mumbai Indians, as well as Indian cricket, had a moment of a scare in the 3rd game of IPL 2019. 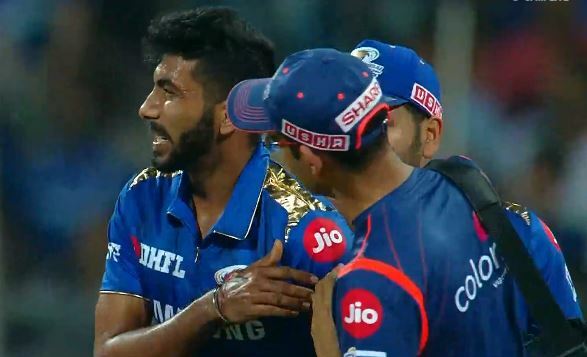 Jasprit Bumrah injured his left shoulder in the match between Mumbai Indians and Delhi Capitals at the Wankhede Stadium. While delivering the last ball of the innings, the pacer dived to his left while attempting to stop the ball. But he was seen in extreme discomfort as soon as the impact on the ground happened. The team physio immediately ran for attention. Bumrah left the field, holding his shoulder. Jasprit Bumrah is a key member for his IPL franchise. But more importantly, he is going to be an impactful part for India’s campaign for the World Cup later this year. There have been several concerns raised over the fitness of the Indian players for the mega event. An injury to the No.1 ODI bowler would be a huge blow for the national side. But the good news is that the fast bowler is doing fine. When Mumbai was batting, Sanjay Manjrekar, on commentary, mentioned that the Mumbai Indians camp has confirmed that Jasprit Bumrah is fine. However, it remains to be seen whether he would feature in the next game or take a precautionary off. The hosts didn’t have a great time in their opening game of the season. They conceded 213 runs in the 20 overs. Rishabh Pant powered his way to 78 from just 27 balls that propelled his side to a huge score. Bumrah too had an indifferent day as he conceded 40 runs from his 4 overs. MI couldn’t climb the mountain of runs and fell short by 37 runs.